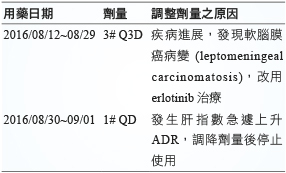 Lung cancer is the leading cause of cancer-related mortality in Taiwan. Non-small cell lung cancer (NSCLC), the most common cause of lung cancer, accounts for approximately 85% of all lung cancer cases. Most of patients present with locally advanced or multiple metastatic diseases at the time of diagnosis leading to significant challenges in treatment. Nowadays, targeted therapies, such as epidermal growth factor receptor- tyrosine kinase inhibitors (EGFR-TKIs), have consistently shown superior efficacy compared with platinum-based chemotherapy. However, if patients with NSCLC develop brain metastases, the first- and second-generation EGFR-TKIs have limited therapeutic effect due to poor efficiency of penetrating the blood-brain barrier. In this case, we discuss EGFR-TKIs in the treatment of NSCLC and present the benefits of the third-generation EGFR-TKIs, osimertinib. 2. National Comprehensive Cancer Network: N-Small Cell Lung Cancer. Version 9.2017. 3. Christina S. Baik, Marc C. Chamberlain, Laura Q. Chow: Target therapy for brain metastases in EGFR-mutated and ALK-Rearranged Non-small cell lung cancer. J Thorac Oncol 2015; 10(9): 1268-1278. 4. Eunyoung Lee, Bhumsuk Keam, Dong-Wan Kim, et al: Erlotinib versus Gefitinib for control of leptomeningeal carcinomatosis in non-small cell lung cancer. J Thorac Oncol 2013; 8(8): 1069-1074. 5. Akito Hata, Reiko Kaji, Shiro Fufita, et al: High-dose Erlotinib for refractory brain metastases in a patient with relapsed non-small cell lung cancer. J Thorac Oncol 2011; 6(3): 653-654. 6. Fukuoka M, Yano S, Giaccone G, et al: Multi-institutional randomized phase II trial of gefitinib for previously treated patients with advanced non-small-cell lung cancer (The IDEAL 1 Trial) [corrected]. J Clin Oncol 2003; 21: 2237-2246. 7. 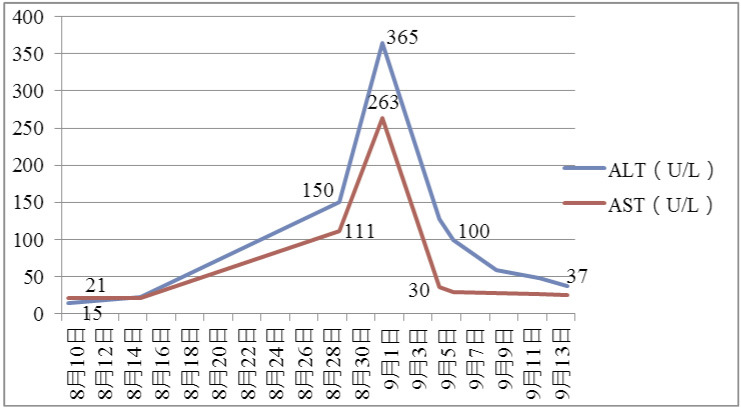 Yamamoto N, Horiike A, Fujisaka Y, et al: Phase I dose-finding and pharmacokinetic study of the oral epidermal growth factor receptor tyrosine kinase inhibitor Ro50-8231 (erlotinib) in Japanese patients with solid tumors. 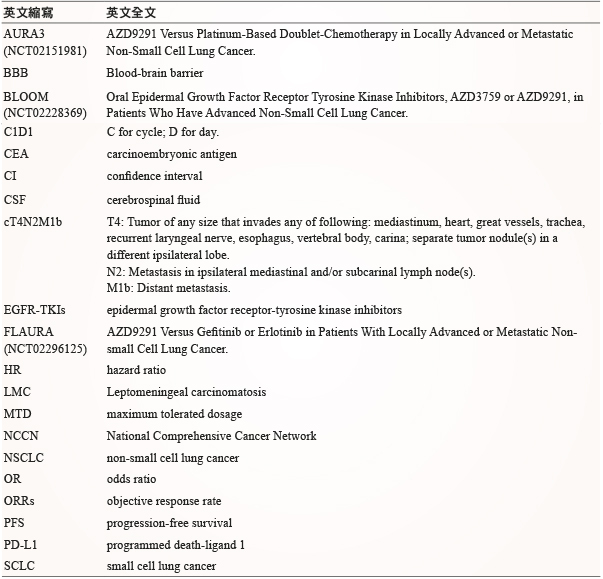 Cancer Chemother Pharmacol 2008; 61: 489-496. 9. Mariacarmela Santarpia, Alessia Liguori, Niki Karachaliou, et al: Osimertinib in the treatment of non-small-cell lung cancer: design, development and place in therapy. Lung Cancer: Targets and Therapy 2017; 8: 109-125. 10. 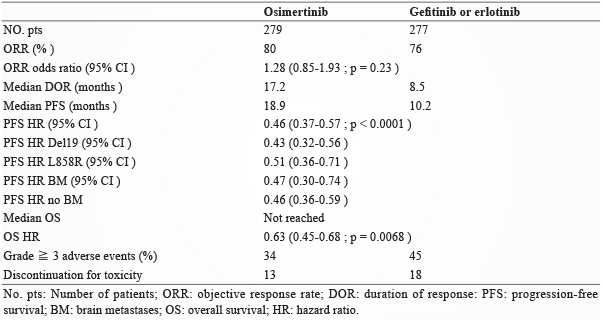 Antonio Rossi, Lucia Anna Muscarella, Concetta Di Micco, et al: Pharmacokinetic drug evaluation of Osimertinib for the treatment of non-small cell lung cancer. Expert Opin Drug Metab Toxicol 2017; 13(12): 1281-1288. 11. Shuhang Wang, Stella T. Tsui, Christina Liu, et al: EGFR C797S mutation mediates resistance to third-generation inhibitors in T790M-positive non-small cell lung cancer. J Hematol Oncol 2016; 59. 12. Peter Ballard, James W.T. Yates, Zhenfan Yang, et al: Preclinical Comparison of Osimertinib with Other EGFR-TKIs in EGFR-Mutant NSCLC Brain Metastases Models, and Early Evidence of Clinical Brain Metastases Activity. Clin Cancer Res2016.